PORTLAND, Ore. (KOIN) -- Police officers were called in to help after someone spotted what they thought was a bobcat in Northwest Portland. But it wasn't a bobcat. Officers found the animal Friday night in a backyard in the 2300 block of Northwest Irving Street. It appeared to be a caracal -- an exotic wild cat native to Africa, the Middle East, Central Asia and India. 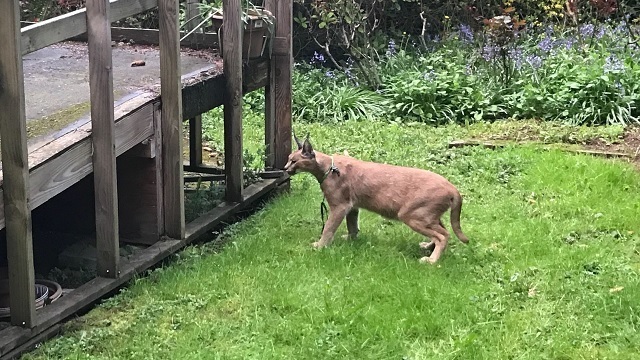 While some of the details surrounding the cat are unclear, such as what the laws are regarding caracal ownership in this region -- one thing is clear: it's not the only caracal in Portland. The Oregon Zoo also owns caracals and has successfully bred the animals. It wasn't immediately clear if officials had managed to recapture the pet caracal that got loose near Northwest 23rd and Irving. Video captured the cat hissing as its owner tried to catch it. The owner said the animal jumped from his apartment balcony into the neighbor's yard. KOIN 6 News is working to learn more.